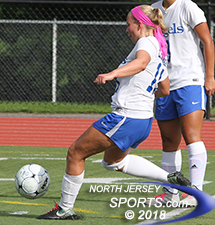 DEMAREST – In a still scoreless game that was hurtling towards full time, one fortunate bounce of the ball could make a real difference. Fifth-seeded Northern Valley/Old Tappan and No. 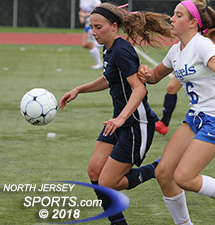 12 Holy Angels saw none of them through the first 77-plus minutes of their Round of 16 game in the Bergen County Tournament. In the final 3:39, there were three and they turned what was an extended stalemate into a wild finish. Old Tappan got a goal with 2:33 remaining in regulation, Holy Angels and answered with less than one minute to go in the second half and junior Kiera DeNicola brought an end to the festivities with a foot-flick of a free kick 1:06 into overtime for the Golden Goal that gave the Golden Knights a 2-1 win and a spot in next weekend’s quarterfinal round. Old Tappan had most of the best chances through the first 77 minutes, but Holy Angels had its moments on the counter attack using senior Alex Cardona as a midfield target. Cardona, a classic hold-up midfielder, gave the Angels a pressure valve as she can possess with her back to goal while her teammates get forward. That being said, neither team could dent the net until the ball started spinning funny on the turf field at Northern Valley/Demarest High School. Olivia Leonard got Holy Angels even at 1 on this shot with 54 seconds left in regulation. The first time it happened was the end result of a precise pass down the middle from Jennifer Fernandez to DeNicola, who ran on and headed toward the Holy Angels penalty area where a defender stepped bravely into her path. One foot from each player struck opposite sides of the ball at the same time, which sent it forward and to the left where Ellie Olivo, who was properly stationed out wide, calmly took possession and hit the lower left to finally break the deadlock. With just 2:33 remaining and having yielded little in the way of scoring chances, Old Tappan looked like a shoe-in to move through to the next round. Holy Angels threw all of its players forward, a strategy that, in high school soccer at least, usually leads to a breakaway at the opposite end of the field. Instead, the Angels were handed a lifeline, a rip of opportunity 25 yards from goal and just to the right of the center of the pitch. Olivia Leonard hit the shot with some english. The ball took one hard hop about six yards from the goal line and took a hop over the shoulder of the keeper and in to pull the Angels back even just 54 seconds before the final horn was to sound on their county tournament run. Ellie Olivo scored the goal that put Old Tappan in front with 2:33 left in regulation. After Old Tappan’s defense broke unexpectedly in the final minute, the Knights ignored the emotional ramifications and got right after it in the extra session. They got possession first, made something out of it when Taylor Newman made a run up the left, cut back inside and got off a one-hop shot that AHA keeper Ellie Kasprzak handled cleanly. It was the ensuing punt that put the game-winning sequence into motion. Old Tappan won the ball in the air and then earned a free kick when it moved back in to attack the goal. Cara Hliboki took the restart and her teammates were fully expecting the freshman to take a stab at the upper shelf. Instead, Hliboki hit a line drive toward the wall comprised of players from both teams and hoped for the best. DeNicola was in that wall and was the first to get a touch. That is exactly what happened. DeNicola got her leg up and popped the ball on a high arc over the scrum, which put Kasprzak in an impossible situation. Probably screened, Kasprzak did not have time to read the hop and close it down before it could gain altitude and once it did there was no Plan B. The ball hit the bottom of the crossbar just right and bounced down and over the line to give Old Tappan the victory 1:06 into overtime. It was a tough way to go out for Holy Angels, which is building steadily under Potkulski. The Angels are 4-7 on the season, but are tested every time out in a division that includes teams like IHA, DePaul and Paramus Catholic. Old Tappan is also exceeding expectations. Wehmann, who took over for Tom Quinn, who stepped down after 23 successful years as head coach, has the Knights believing. With only three seniors on the roster — Newman, Taylor Dolan and Megan King – Old Tappan is ahead of schedule as it has won seven of its nine games this season and has lived up to its No. 5 seed as it takes its place in the county quarterfinals. Because of league realignments, and the ridiculousness of some of them, Old Tappan was not scheduled to play its sister school and closest rival, Northern Valley/Demarest, at all this season. That has now been remedied now as the two will square off with a trip to the Bergen County Final 4 on the line next Sunday at Indian Hills High School.